Screen capture from The LGBT Whip, a new web-based app which launched this week. As Britain goes to the polls today, some LGBT voters may have a clearer picture of which candidates support their equality thanks to a new website launched this week. 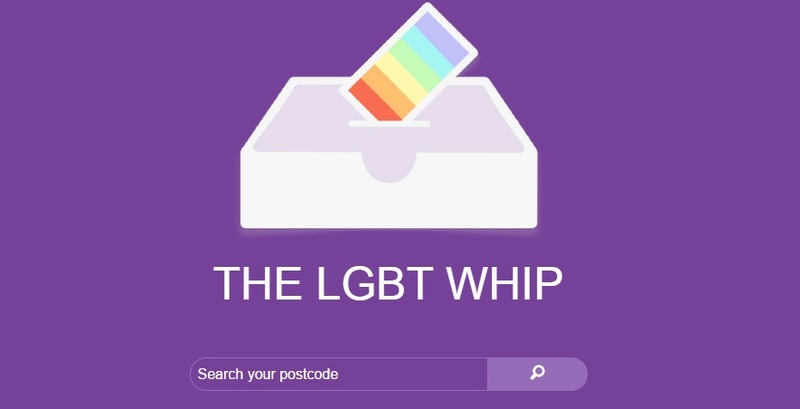 The LGBT Whip is the brainchild of Chris Ward, a developer from Vauxhall who also helped develop the LobbyALord app used by marriage equality campaigners in 2013. While LobbyALord was intended to help win equal marriage, The LGBT Whip takes a broader approach to equality issues, and is intended to illustrate, rather than change, a candidate’s position. 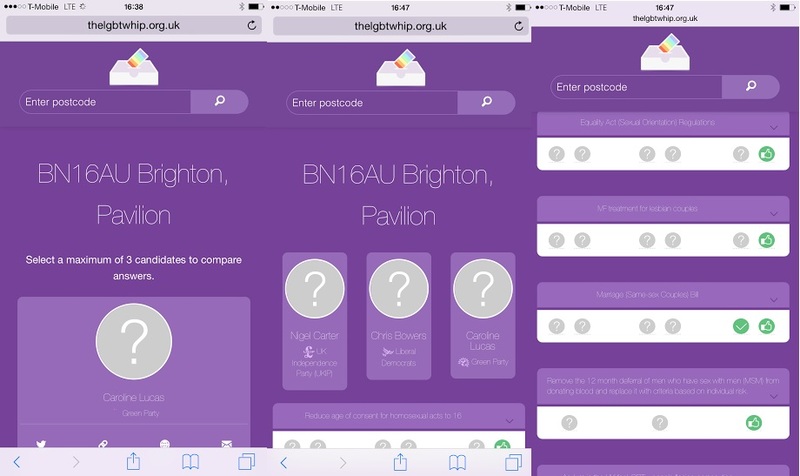 The first frame shows what happens when voters select their postcode. The second frame shows a list of of candidates, while the third frame compares them on the issues. The questions include historic positions, such as Section 28, as well as issues currently being debated, like banning conversion therapy. For those former MPs who haven’t responded, their votes have been gathered and made available. Candidates who have never sat in parliament “have a clean slate,” because, as Mr Ward put it, “I’d rather go by what they actually do in the voting lobbies than what they say to a journalist, because that’s what makes the law.” It was important to ask about both the past and the present, he said, because equality can be lost just as it was won. Though MPs who voted against LGBT rights in the past can’t erase their slate, they can still show they’ve come round to equality, as has already happened. LGBT Whip is the result of a collaboration between Chris Ward, Peter Burjanec, Joshua Gladwin, Hereward Mills, Chimeren Peerbhai, Matt Ward, and Adriana Vecc. Though currently only available for the UK general election, the team has plans to eventually expand to include the Scottish Parliament, Welsh and Northern Irish Assemblies, and possibly even foreign elections, including the 2016 US general election. It is dedicated to the memory of Ms Peerbhai’s mother, Debra Diane Rich, who recently passed away from cancer in America. 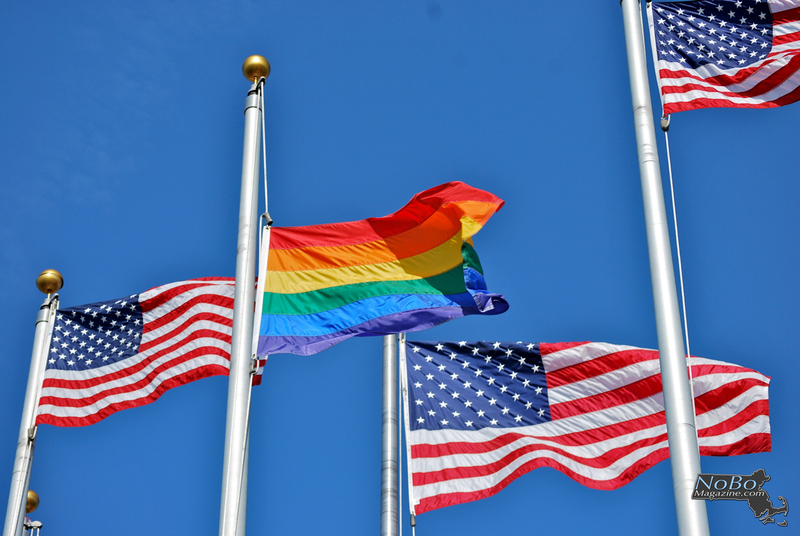 This entry was posted in LGBT, Politics, Tech and tagged apps, british politics, ge2015, lgbt rights, politics, tech, thelgbtwhip on May 7, 2015 by skylarjordan. Photo courtesy of the Open University. Tonight, BBC News broadcast the Northern Ireland leaders’ debate from Belfast, the last of the general election debates ahead of Thursday’s vote. Though mostly ignored in the national campaigns — in large part because none of the major parties have a heavy presence there — Northern Ireland could yet play a deciding factor in who will soon occupy Number 10. Northern Ireland is unique in the United Kingdom. Marked by years of sectarian violence between unionists who wished to remain in the UK and nationalists who wished to join the Republic of Ireland, it is still a country struggling to reconcile its past with its future. But what really struck my interest was the fact that, perhaps for the first time in the entire election, LGBT rights took centre stage. Equal marriage arrived in England and Wales early last year; it followed in Scotland shortly thereafter. Even the Republic looks like it may vote for equal marriage later this month. But Northern Ireland, deeply traditional and conservative, has held out. 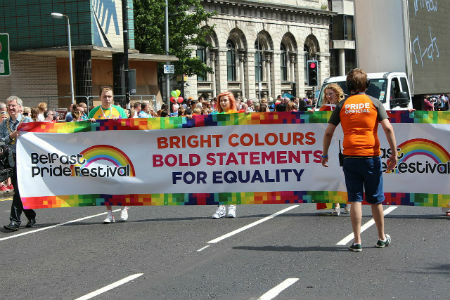 In April, the Northern Ireland Assembly rejected equal marriage for a fourth time. This follows the controversy surrounding the Ashers Bakery, which is currently in court fighting charges it discriminated against an LGBT group by refusing to bake a cake supporting gay marriage. And just last week the DUP’s health minister resigned after saying that gay parents were more likely to abuse and neglect their children than straight parents. The Democratic Unionist Party (DUP) is the largest Northern Irish party in the Westminster parliament. As the right-wing website Brietbart UK reported, it is likely to have 9 seats in the next parliament which could prove deeply important to a possible Tory minority government. It is an extremely socially conservative party, though with a strong contingent of pro-labour sentiment. Sinn Féin — the Irish nationalist party — tends to be more left-wing, but has long refused to take the seats they are elected to, believing the Westminster government to be illegitimate in Northern Ireland. The other party supportive of equal marriage, the Alliance Party, has one MP who may well lose her seat on Thursday. This is all idle speculation, and there is no guarantee that the DUP will even play a significant, or indeed any, role in any coalition. To my knowledge, none of the major party leaders have publicly entertained the idea. Plus, as the Christian Science Monitor put it, “Northern Ireland may simply be too distant from Westminster thinking for either Labour or the Tories to find common ground” with the party. But in an election that’s been defined by the rising profiles of a right-wing populist party (the United Kingdom Independence Party, or UKIP) and of nationalist parties such as the Scottish National Party and Wales’ Plaid Cymru, it’s also easy to imagine the appeal to Miliband and especially Cameron of aligning with a populist, pro-union contingent from outside England. So if Northern Ireland is to play kingmaker, it’s likely to be the result of MPs antagonistic, or at least antipathetic, to LGBT rights. It’s not a stretch, given the tensions over the issue in Belfast, that one of the DUP’s “red lines” (as the press has taken to calling non-negotiable policy positions in potential coalition negotiations) might be no further advances in LGBT equality. That could mean up to and including halting any efforts to tackle homophobic bullying in schools. This has been a pet project of the Tories’ education secretary, Nicky Morgan who, it’s worth noting, voted against equal marriage. UKIP, with its reputation and record, are unlikely to cringe at the DUP’s positions. And the majority of Tory backbenchers did vote against equal marriage. In that context, a grand coalition of the right including the DUP, and their anti-gay policies, becomes more imaginable. What that might mean for people remains to be seen. But judging by what’s happening in Northern Ireland, if the DUP is allowed to hold any of the balance of power in Westminster, it won’t be good for the LGBT community. It’s something few have entertained, but in an election where anything is possible, it’s one activists, and indeed the country, should consider as they tick that box on Thursday. This entry was posted in Commentary, Politics and tagged british politics, ge2015, lgbt rights, northern ireland on May 5, 2015 by skylarjordan. This is the first in a series of Throwback Thursday posts I’m going to be doing, highlighting my work at now-defunct publications I’ve written for in the past. This is a piece I wrote on the National Equality March in Washington, D.C. which took place several years ago. It first appeared in the October 2009 issue of Rise Over Run Magazine. The sun was wicked, but the air cool and crisp. Standing in a crowd of thousands, swelling and expanding by the second like a balloon ready to pop, I tingled with anticipation. Students from Western Kentucky University, Northern Kentucky University, and Bellarmine University—an unofficial Kentucky contingent—were chatting merrily, albeit loudly, as the roar of the crowd, chanting and singing before they even began walking, drowned out most anything else. A middle-aged woman I was talking to began staring at the group. “You’re all college students?” she asked. I nodded. “It’s hard to believe how many young people are here. I feel so old,” she laughed. This was a common sentiment expressed by older people at National Equality March, a march of approximately 200,000 lesbian, gay, bisexual, and transgender Americans, as well as their allies, in Washington, D.C. Though practically every age group in America was represented in the hundreds of thousands of marchers, it was the Millennials—loosely defined as those born between the late 70’s and early 90’s—who stood out. Chanting ferociously and demanding “equal protection in all matters of civil law in all 50 states,” according to the National Equality March’s Facebook page, a new generation of LGBT Americans came out to the nation this month. Activist David Mixner first called for an LGBT march on Washington—the first since 2000’s Millennium March—last spring, and at the Meet in the Middle rally in Fresno, California following the California Supreme Court’s ruling upholding the constitutionality of Proposition 8, Cleve Jones, the veteran gay rights activist and disciple of Harvey Milk, made the first public call. Despite initial hesitation and a few prominent naysayers, including openly gay Congressman Barney Frank, (D-MA) who was quoted by the Associated Press as saying “the only thing they’re going to be putting pressure on is the grass,” it was quickly apparent: the gays were marching in. And though Mixner and Jones, both elder statesmen of the LGBT community, were the ones who called for the march, it was young LGBT Americans they were interested in reaching. Mixner and Jones set out to inspire Millennials to step up to the plate. Looking around at those marching, and listening to the speakers on stage, you couldn’t help but to feel they had succeeded. What made this march different than any before it was that, for the first time, a new, liberated generation was stepping up to take over the reins of the LGBT community. The Millennials were on the march. To understand why young LGBT people responded to Mixner’s and Jones’s calls requires delving into the psychology of a generation. This is a generation that grew up in the era of Will and Grace, Queer as Folk, and The L Word. As being gay became more socially acceptable over the last decade, to gay youth, so did inequality. Still, the social progress being made gave a false sense of hope for legal progress, and many LGBT youths simply felt progress was inevitable. This myth was jarringly shattered last November, when California’s Proposition 8 passed, banning gay marriage in that state. Like many of his contemporaries, Efinger, 25, was not politically active before Proposition 8. However, following its passage, Efinger felt a call to action. After discovering you could send letters and postcards to the president, Efinger decided to enlist some of his friends to help, eventually taking his initiative to the bar he works at in West Hollywood, California. From there, events were held in New York and San Francisco, and to date over 15,000 postcards have been sent from nearly 30 states. The Second Great March on Washington? Kat Michael echoed this sentiment. Michael, a junior originally from Louisville, is the president of the Student Identity Outreach (SIO) at Western Kentucky University. SIO took 18 students to Washington, driving nearly 1400 miles round-trip in less than 48 hours. But for Michael, the trip was worth it. “It was great to see that number of people come from such long distances,” she said. “The way the people managed—fly, train, car, boat it—they got there and that’s really encouraging to see with this movement.” Michael says that hailing from the south, people often think LGBT people aren’t organized. She wanted to dispel that myth. For Tobias Packer, it was an opportunity to represent not only himself and Equality Florida, but also transgender Americans. “There are definitely moments where I have felt, as a transgender person, excluded or overlooked intentionally or unintentionally,” Packer said, pointing specifically to the 2007 passing of a non-transgender inclusive Employment Nondiscrimination Act in the House of Representatives. (The bill died in the Senate.) For Packer, the march was a way to take his—and Equality Florida’s—message to a national level. While the march gave Millennials a chance to vent their anger at the establishment, it also served as an opportunity to rise to the challenges facing their movement. “In many ways it represents a passing of the torch,” Sam Sussman said. “The demographics are changing. I think now you see a new civil rights movement brewing among young people.” Sussman predicts the movement will now be carried by younger people. Kat Michael also believes that this new generation has risen to the challenge and is beginning to take over the reins of the movement. “The youth is really what’s going to carry this movement forward,” she said. “Those individuals who have been fighting this fight their whole lives, who were part of the Stonewall Riots, are getting tired now. They have beaten down a path. It is our time to pave it now.” Michael believes the real point of the march was to inspire a new generation of LGBT leaders. Still, Nguyen isn’t without criticism of his generation, which he still views as apathetic. 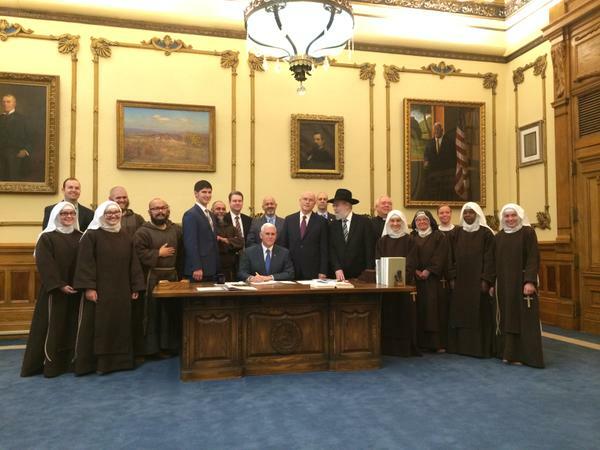 He was particularly hard on the gay community in Bowling Green, which he was “thoroughly disappointed by.” “With the exception of SIO… they stayed here for fun. They didn’t want to ask for work off. A lot of them had the money, a lot of them had the ability.” Nguyen, who traveled with a group of friends to DC (including Adam Swanson, a WKU student heavily involved with Tanner Efinger’s “Postcards to the President” but was unfortunately unavailable for comment as of press time), says a lot of LGBT locals decided to forgo Washington, instead opting for a trip to Miami. The one sentiment echoed by Tanner Efinger, Kat Michael, Mario Nguyen, Tobias Packer and Sam Sussman was that the work does not end with the march. The words of Cleve Jones—“we are not organizing to march; we are marching to organize”—resonate with these five individuals, all of whom headed back to their respective states eager to continue working, feeling they have established their presence in the broader LGBT movement. Efinger returned to West Hollywood, where he is still working as a cocktail waiter, but with a renewed sense of service. He plans on continuing with Postcards to the President and remaining active in Equality Across America, a new national organization born of the National Equality March. “From here we organize everyone in their congressional districts…what we’re really trying to do is plant the seeds of social change,” he said. And while he’d like to return to his original passion—writing—right now his activism has taken precedence. “I want to get this done now,” he said. Sam Sussman, on the other hand, is going to continue his political advocacy with the Alliance for the Realization of Legal Equality. He’s also beginning to work with a new national organization, The Right Side of History, a campaign which, according to its website, is “a movement of young, inspired Americans who have committed to no longer be silent. “ Sussman hopes to begin a chapter at Binghamton University. Also in Sussman’s future is a statewide initiative to pressure four to five select New York state senators to vote for marriage equality. Sussman hopes to secure enough votes to pass a marriage equality bill through the New York state assembly next year. Kat Michael returned to WKU ready to continue working with SIO. “The work hasn’t stopped for me, it hasn’t stopped for my members,” she said. “I don’t think any of them feel that things have stopped now… we’re all really willing and ready to go.” She says that the march was SIO’s way of showing they’re going to be a permanent presence on campus, and that they exist to serve more than just their friends. “We’re not just here to hide and take care of our own friends, we’re here to take care of everything,” she said. Thinking back to the day of the march, I’m left wondering what effect the National Equality March will have. It is not the first, or the biggest, LGBT rights march on Washington. Yet somehow, this one feels different. This one feels like instead of capitalizing on momentum the movement had, the march itself created a sort of momentum, sending grassroots activists into the trenches, prepared to wage proverbial guerrilla warfare in the name of equality. It also feels different because, for the first time, my generation—the Millennials—is beginning to take the reins. What’s unique about the burgeoning leaders is that they are, for the most part, amateur activists. For every professional lobbiest or community organizer are dozens of people like Kat Michael, Sam Sussman, and Tanner Efinger who started organizations aimed to make a difference—not because they were paid to, but because they saw a need not being met. And while the LGBT movement gears up for fights over marriage in Maine and domestic partnerships in Washington state, these five young leaders expect things to continue trending toward equality, and expect their generation to take a more active role in these struggles. And the Millennials are running in, guns-a-blazing. This entry was posted in Politics, Universities and tagged gay rights, lgbt, lgbt rights, millennials, national equality march, protests, transgender on February 13, 2015 by skylarjordan.